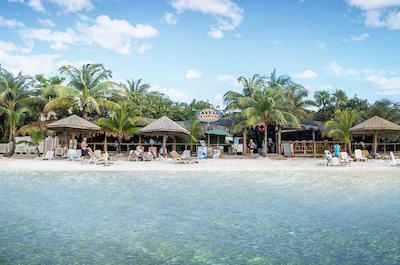 Below are the most fun things to do in Roatan, Honduras, that will leave you with lasting memories after you depart this Caribbean paradise. Families will enjoy horseback riding through the jungle and along pristine white beaches as well as ziplining through the jungle canopy. 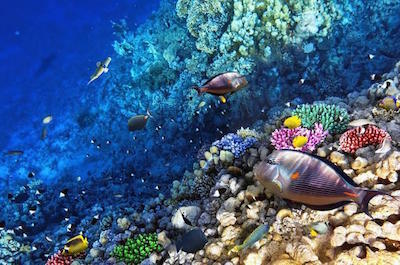 Snorkeling and scuba divers can take advantage of the world’s second largest reef while viewing the brightly colored coral reefs within the Mesoamerican Barrier Reef. There are animal sanctuaries and butterfly gardens or you can visit a private island for a full day of fun under the sun. Other options include walking through a butterfly garden, buying that perfect piece of recycled art at the Rusty Fish and don’t forget all the white sand beaches like West Bay, Tabyana and Sandy Bay when you just want to relax. If your family likes to view amazing jungle landscape and see a variety of native animals living in their natural habitat then an ideal thing to do in Roatan is to take a Nature and Wildlife Tour. 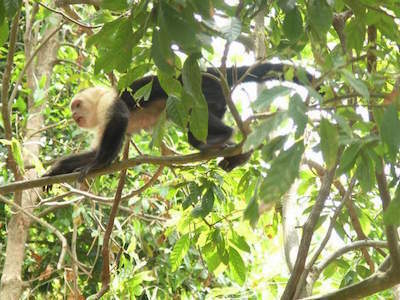 You will be thrilled with variety of excursions that will have you watching several species of monkeys like howler, white-faced, capuchin as well as spider monkeys playing in the own backyard. The plants as well as trees of the island are colorful with a lasting sweet aroma that will please your senses and you will be surprised at the numerous species of birds from toucans to scarlet macaws to parrots that you will see. There are excursions that will have you hiking through jungle, ziplining over the canopy and even viewing the incredible marine life from a glass bottom boat just offshore of West Bay Beach. The most popular thing to do in Roatan for families that like adrenaline combined with gorgeous natural scenery is to go on a Zipline Tour. 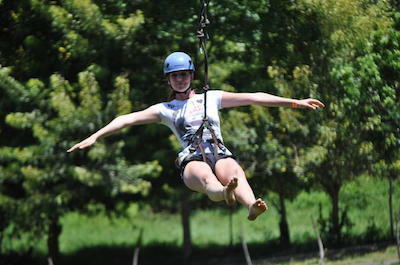 These excursions are perfect for all ages as you will experience breathtaking speeds as you soar above the canopy. The incredible jungle landscape will have you flying on up to 23 different platforms with over 7,000-feet of zipline cables. You can fly like Superman as you view monkey, sloths and hundreds of brightly colored bird species. There are hanging bridges over canyons you can walk over and hiking trails for you to explore the surrounding jungle environment. An added bonus on most of these tours is a stop at the beach where you can relax or perhaps go jet skiing. 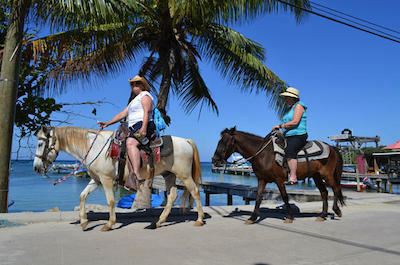 One of the best family-friendly things to do in Roatan that is relaxing and offers you a chance to view wildlife in a beautiful tropical landscape is to take a Horseback Riding Tour. No matter what level of skilled rider you might be there is a horse that is just perfect for you and everyone in the family. You will be delighted with following your trail guide through the pristine jungle areas while you spot spider and howler monkeys as well as hundreds of species of bird that call the island home. As you emerge from the jungle you can view the incredible hues of blue that make the Caribbean Sea such a special place as you ride on white sand beaches and there will even be time to take a quick dip in the warm waters. 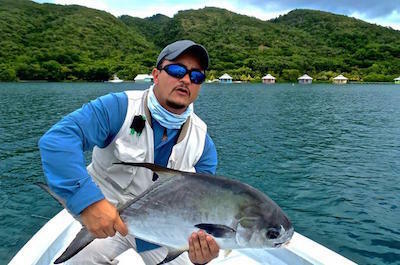 If you dream about catching that lifetime trophy fish while on vacation and want to spend a relaxing day on the Caribbean Sea then a superb thing to do in Roatan is to try a Fishing Tour. You will be pleased with options you have from fly or spin rod to deep sea fishing that will help make your dreams come true. Fly and spin rod options will have searching for Permit, Tarpon and Bonefish as you gaze upon the clear blue waters. Deep sea fishing options will have you exploring for marlin, grouper and parrotfish. These excursions are perfect for families and include lunch as well as beverages as you relax while the captain takes you to the perfect fishing hole. If you are interested in exploring the underwater world that exists in the Caribbean Sea then the best thing to do in Roatan is to take a Snorkeling Tour. These excursions are fabulous for novice and expert snorkelers as you view the Mesoamerican Barrier Reef which is the second largest in the world. As you explore you will see hundreds of tropical fish, unique geologic formations and brightly colored coral reefs that numerous species of marine life call home such as sea turtles, dolphins as well as manta rays. You will adventure to the reefs surrounding West Bay Beach and West End as well as portions of the eastern shoreline around French Key. An added bonus on some tours is a paddling a kayak or combining this adventure with a deep sea fishing experience. One of the more popular things to do in Roatan for water enthusiasts that like exploring the underwater world is to go on a Scuba Diving Tour. 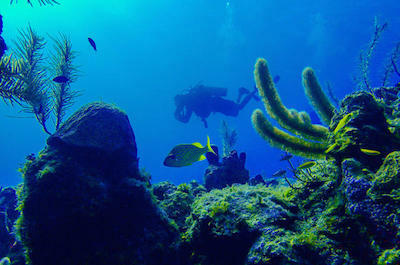 Roatan is a scuba divers haven with the Mesoamerican Barrier Reef which surrounds the island. This reef is the second largest in the world and offers hundreds of unique dives sites such as Mary’s Place, Coco View and the Dolphin’s Den as well as the El Aguila shipwreck. You can explore canyons, coral reefs, walls and you are assured of viewing incredible marine life such as hundreds of tropical fish, sea turtles, dolphins as well as manta rays. Depths range from 30 to 180-feet with one or two-tank dives available and the excitement of every foot you descend will leave lasting memories. If you are looking for a stellar beach area that offers plenty of amenities and watersport activities then the best thing to do in Roatan is to visit West Bay Beach. 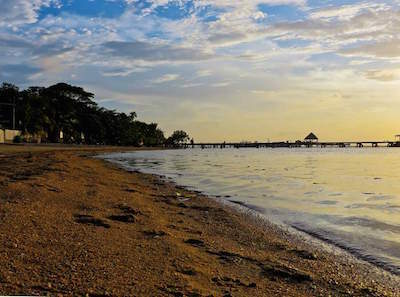 Located along the northwestern shoreline of the island, West Bay Beach is a perfect stretch of white sand that is ideal for water enthusiasts as well as all types of beach goers. West Bay Beach is a superb place to snorkel with the Mesoamerican Barrier Reef less than 150-feet from the shoreline and scuba diving is a big attraction. Other activities include glass bottom boat rides, kayaking and standup paddleboarding as well as a plethora of beach games. There are several restaurants and beach bars like the Thirsty Turtle Bar and Grill as well as the Hangover Hut. When you are through playing on the beach or the warm Caribbean Sea you can go shopping for your favorite souvenir at the West Bay Mall. 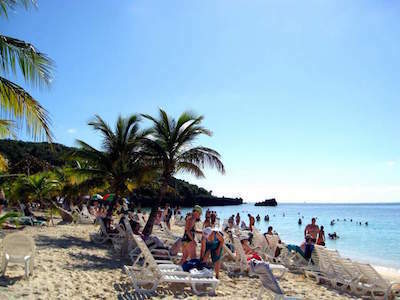 If you are searching for a less crowded beach that offers plenty of amenities like restaurants, watersports and beautiful swimming then an ideal thing to do in Roatan is to plan a day at Sandy Bay Beach. Located on the northwest shoreline of the island, Sandy Bay Beach is north of West Bay and is accessed off of West Sandy Bay Beach Road via the Carretera Principal. Sandy Bay Beach has perfect white sand where you can lounge or play beach games like volleyball or soccer. There are plenty of opportunities for watersport activities that range from kayaking to standup paddleboarding to jet skis and there is great snorkeling as well as scuba diving just 200 yards offshore. If you are looking for a side attraction to visit on the way try the Carambola Botanical Gardens and Trails or stop at Dolphin Encounter for a quick swim with dolphins. This long stretch of sand is also home to several beach bars such as the Blue Bahia Beach Grill, the Sunken Fish Tree Top Ocean View Bar and Restaurant and the Salty Mango. When you are searching for a family friendly mixture of activities that combine beautiful white sand beaches with exotic animals and an adrenaline filled zipline course then an ideal thing to do in Roatan is to plan a trip to Gumbalimba Park. Located along the southwestern shoreline of the island in West Bay, the Gumbalimba Park is situated on 20-acres of tropical landscape with a white sand beach as well as a thrilling zipline course and is home to several exotic animals just waiting to take photographs with you. Once inside Gumbalimba Park you will notice howler monkeys, capuchin monkeys, spider monkeys and a variety of exotic bird species that range from toucans to scarlet macaws. The activities at Gumbalimba Park are numerous with a 17 platform zipline course, a freshwater swimming pool that has a kid’s area and there is plenty of white sand on West Bay Beach where you can relax under the sun. Gumbalimba Park is also home to over 200 native plant and tree species to the island and your senses will be delighted with the waterfalls, hanging bridges and fountains. When you want to spend the day in a tropical paradise that combines powdery white sand and the second largest reef in the world then the best thing to do in Roatan is to take a day trip to Tabyana Beach. 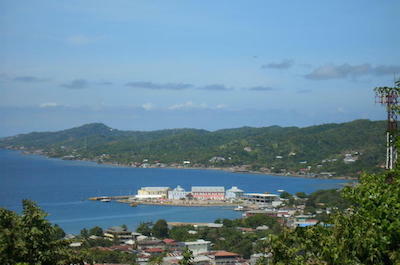 Located on the southern section of West Bay Beach, Tabyana Beach is situated on part of the former Tabyana Beach Resort and is accessed by water taxi from West End or off of West Bay Road. Tabyana Beach is wonderland of activity along this perfect stretch of white sand that includes plenty of hammocks, palm and coconut trees for shade as well as a plethora of watersport activities. Snorkeling is very popular at Tabyana Beach with the Mesoamerican Barrier Reef only 70 feet offshore and you can try SNUBA if you like. Other activities include beach volleyball, swimming and kayaking as well as standup paddleboarding are available for rent. Other attractions nearby include Gumbalimba Park where you will find a zipline course. You will find a restaurant, showers and restrooms for comfort. 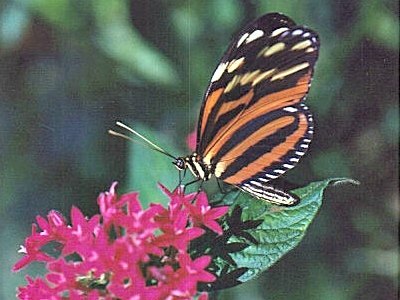 One of the more family friendly things to do in Roatan that involves a serene environment filled with nature is to visit the Roatan Butterfly Garden. Located at the entrance to West End, the Roatan Butterfly Garden has a 3,000 square feet enclosure that houses some 20 species of butterflies with many of butterflies native to Honduras. The Roatan Butterfly Garden portrays a natural landscape for the butterflies which at times can be filled with more than 200 butterflies flying amidst a collection of native trees, plants and flowers. The walkways within the enclosure at the Roatan Butterfly Garden are lined with a variety of tropical fruit trees, orchids, ginger and hibiscus which make the natural landscape more appealing to your senses. As you walk through the exhibit you will notice interpretive signs explaining some of the native species as well as the lifecycle of a butterfly. You will be delighted with other flying creatures such as humming birds and there are several birds native to Honduras on display like toucans, parrots and macaws that were rescued in the past. Visiting the Rusty Fish is one of the more unique things to do in Roatan for people who like to view native artisan craftsmanship in the form of artworks and souvenirs. Located on West End Road along Half Moon Bay, the Rusty Fish specializes in unique pieces of jewelry, home furnishings as well as arts and crafts which are made from recycled materials such as metals, acrylics, sea glass, wood and paper. You will be amazed at the colors that the local artisans combine when created these fabulous pieces of recycled art. The incredible designs that are produced by the local artisans bring to life the influences of the Caribbean and highlights Honduras. The Rusty Fish has been in business since 2009 and now employs over 17 people who follow the process from gathering the recyclables to sorting the material to the artisans who bring the trash back to life. When you want to mingle with numerous exotic animals and learn about new conservation methods for endangered species then the best thing to do in Roatan is to visit the Daniel Johnson’s Monkey and Sloth Hang Out. Located 6-miles north of Mahogany Bay in French Cay along the eastern shoreline of the island, Daniel Johnson’s Monkey and Sloth Hang Out is situated on French Harbor and is a safe haven for a variety of rescued animals that have been brought back to health. Once you enter the grounds at Daniel Johnson’s Monkey and Sloth Hang Out you will be pleased with the tropical surrounding that the animals can enjoy. As you walk through this sanctuary you will see spider monkeys, capuchin monkeys, two-toe sloths and a variety of exotic birds like scarlet macaws, toucans as well as parrots. There will be numerous photograph opportunities of you holding monkeys or even cuddling a sloth and you can take a photo of a rare South American raccoon that calls the sanctuary home. When you want to combine a day at the beach with culture and the beautiful Caribbean Sea then the perfect thing to do in Roatan is to plan a visit to Maya Key Beach. Located off the eastern shoreline of the island near the Roatan Cruise Pier, Maya Key Beach is a private island that is11.5-acres and features several attractions from a white sand beach to scaled down Mayan Ruins to lush nature trails. Once you are at Maya Key Beach you will be thrilled with the two secluded white sand beach areas that offer plenty of space for lounging along with excellent snorkeling and swimming opportunities. You can enjoy viewing several animals in their own natural habitats such as jaguars, spider monkeys, sharks, crocodiles and there is a mangrove forest filled with wildlife. Another popular activity at Maya Key Beach is to walk through the scaled down Mayan Ruins and the Mayan Interpretation Center. There is also a 70,000 gallon freshwater swimming pool, restrooms, a gift shop and restaurant as well as watersport equipment rentals. If you are interested in visiting a private island that is packed with activities from snorkeling to animal rescue center to just relaxing at the pool then a perfect thing to do in Roatan is take a trip to Little French Key. Located 10-minutes north of Mahogany Bay along the southeastern shoreline of the island, the Little French Key is packed with amenities that are sure to please the whole family. When you arrive to Little French Key you will be happy with lush tropical landscape, the secluded white sand beaches and the numerous freshwater swimming pools as well as the animal rescue center where you can view exotic animals like white-faced monkeys. The Little French Key is packed with activities from snorkeling to kayaking to building a sand castle to lounging by one of the freshwater swimming pools. Other options include having a cold libation at the Caribbean Sea swim-up bar or you can try lunch at Frenchy’s 44 and there is even a small zipline course that will have you soaring above the island’s canopy.